Angola, richly endowed with resources including oil, diamonds and other minerals, is a strategic partner with enormous economic potential. President Jacob Zuma was in Luanda‚ Angola, recently on a Working Visit during which he met his counterpart, President Jose Eduardo dos Santos. “The heads of state will discuss issues of bilateral and regional importance and the visit will contribute to further strengthening the historical relations between the two countries,”Tthe Presidency said prior the visit. Since 2009, there has been an increase in trade cooperation between South Africa and Angola. Thirty-three agreements and memoranda of understanding have been signed over the years, covering various fields, including agriculture, health, education, trade and industry, defence and security, transport, energy as well as arts and culture. Between 2009 and 2012, two-way trade statistics show Angola as one of South Africa’s largest trading partners on the continent. Angola is currently ranked eighth, with R22,5 billion of imports largely comprising crude petroleum oil. In 2013, the value of exports to Angola was R9,7 billion. In the same year, the value of imports from Angola was R18,9 billion. On 20 October, Deputy President Cyril Ramaphosa delivered the keynote address at the 11th Annual Symposium of the Electoral Institute for Sustainable Democracy in Africa (EISA) at the Crowne Plaza Hotel, Rosebank. EISA was established in 1996 in Johannesburg with the objective of contributing to the task of building a continent founded on the principles of democratic governance, human rights, peace and citizen participation in Africa. The 11th Annual Symposium also marked the celebration of the 20-year anniversary of EISA. The overarching objective of the 20th anniversary symposium was to review the current state of democracy in Africa by taking stock of progress and challenges confronting the continent in its trajectory of democratic consolidation. The symposium was attended by representatives of international non-governmental organisations, election management bodies, civil-society organisations, aid agencies, the African Union, regional economic communities, political parties, and members of Parliament and the academia. A panel of former African heads of state and government also addressed the symposium. South Africa is a signatory to the Peace, Security and Cooperation Framework Agreement (PSCF), signed in February 2013. 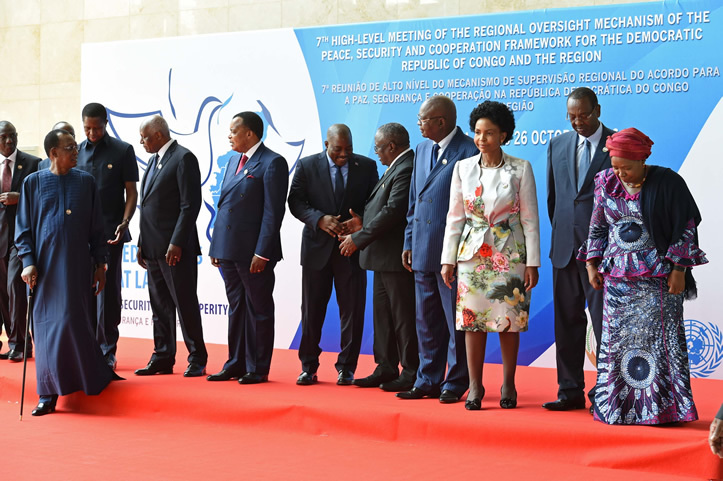 On 26 October, the Minister of International Relations and Cooperation, Maite Nkoana-Mashabane, led the South African delegation at the Seventh High-Level Meeting of the Regional Oversight Mechanism of the Peace, Security and Cooperation Framework for the Democratic Republic of Congo (DRC) and the Region, held in Luanda, Angola. The PSCF seeks to address the recurring cycles of conflict and violence in the eastern DRC. 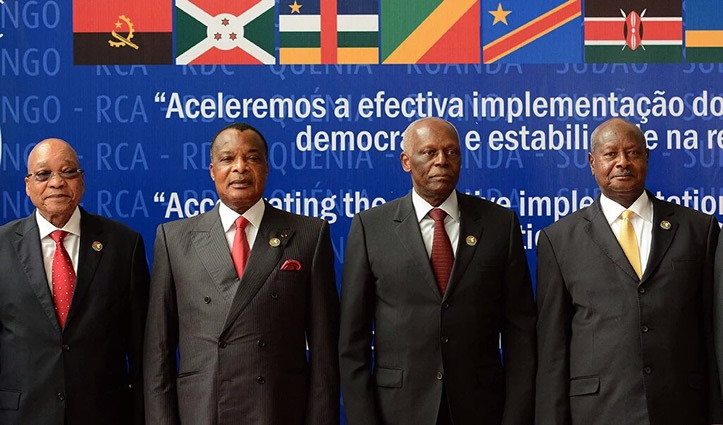 Eleven countries in Africa have signed the PSCF for the DRC and the region, with the African Union (AU), Southern African Development Community (SADC), International Conference of the Great Lakes Region (ICGLR) and the United Nations (UN) acting as guarantors. The heads of state and government and/or the representatives of the following signatory countries and organisations participated in the meeting: the DRC, Angola, Burundi, Congo, Kenya, South Africa, Sudan, South Sudan, Tanzania, Uganda, Zambia, UN, AU, SADC and the ICGLR. The meeting assessed progress in the implementation of the PSCF and discussed developments in the Great Lakes Region. South Africa enjoys good bilateral relations with Austria, focussed primarily on economic exchanges. 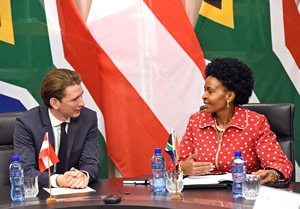 On 24 October 2016, the Minister of International Relations and Cooperation, Maite Nkoana-Mashabane, held a successful bilateral engagement with her Austrian counterpart, Sebastian Kurz, Minister for Europe, Integration and Foreign Affairs. Minister Kurz visited South Africa from 24 to 26 October 2016 with a 50-member Austrian business delegation, which included the President of the Austrian Chamber of Commerce, to explore business opportunities in South Africa. The meeting discussed the growing relations between the two countries and how to build on the recently signed Memorandum of Understanding (MoU) on the Establishment of a Bilateral Consultation Mechanism. The MoU allows for regular bilateral consultations at senior officials’ level to review all aspects of bilateral relations, exchange views on regional and international issues of mutual interest, as well as on developments taking place in regional and international fora. South Africa and Austria have a cordial trade and investment relationship, with total trade in 2015 amounting to R7,76 billion, while South African direct investments in Austria amounted to about R43 billion at the end of 2014 against about R10 billion Austrian investments in South Africa. The ministers discussed possible increased trade and investment in South Africa in support of the five key national priorities and the Nine-Point Plan. They also touched on a number of regional and global issues, such as United Nations reform, migration, nuclear non-proliferation and disarmament, the situation in Syria and Libya, as well as the impact of Britain’s exit from the European Union on Europe. Minister Nkoana-Mashabane also took the opportunity to congratulate and wish the people of Austria well on their National Day this week. At its recent meeting, Cabinet approved that the Paris Agreement on Climate Change be submitted to Parliament for ratification. The Paris Agreement is a legal instrument that will further guide the process for universal action on climate change. It brings all nations into a common cause of acting collectively to the threat of climate change, in the context of sustainable development and efforts to eradicate poverty. It sets the goal of holding the increase in global average temperature to well below 2 degrees Celsius. 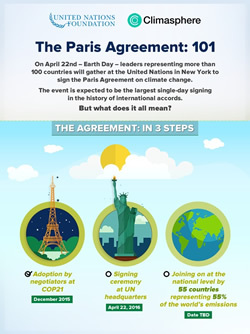 The Paris Agreement will enter into force on 4 November 2016, 30 days after the date on which at least 55 parties to the convention accounting in total for at least 55% of the total global greenhouse gas emissions have deposited their instruments of ratification. South Africa's ratification of the Paris Agreement sends a positive signal of the country’s continued commitment to contribute to the global effort to address the challenge of climate change. From 18 to 20 October, the Department of Planning, Monitoring and Evaluation, in partnership with the World Bank; Centre for Learning on Evaluation and Research (CLEAR); and the Twende Mbele Project, conducted an International Knowledge-Sharing Workshop on Planning, Monitoring and Evaluation (PM&E) in South Africa. The workshop was a capacity-building and learning initiative that sought to increase learning and sharing around the use of PM&E for improved governance for African countries. Information on PM&E was exchanged between all participating peer countries based on shared experiences; challenges and best practice in implementing PM&E. The combined National and Provincial Monitoring and Evaluation Forum Workshop was targeted at various heads of PM&E from national departments, offices of the Premier, PM&E and service delivery practitioners from government. The workshop focussed on the heads of PM&E in government departments from various countries. Brand South Africa’s clean audit performance is a clear indication that the entity is well on track to ensure that South Africa’s reputation at home and abroad is not in tatters, says the Minister of Communications, Faith Muthambi. Minister Muthambi recently presented the 2015/16 Annual Report and audited annual financial statements of Brand South Africa to members of the Portfolio Committee on Communications. “Marketing a brand is a tough and complex task; and this is even more so when brand is an entire nation. The challenges are multiplied by the size and diversity of the target market, which is the entire world, and the critical 54 million stakeholders at home. “In a global economy increasingly driven by services, a country’s brand impacts virtually every aspect of its international engagement, and thus plays a critical role in its economic, social, political and cultural progress,” the Minister said. A clean audit outcome is the highest and most outstanding performance rating which the Auditor-General can give an institution for having performed outstandingly in terms of its planned outputs and financial management. The primary objective of Brand South Africa is to develop and implement proactive and coordinated marketing, communication and reputation management for South Africa. The ultimate aim, the Minister said, was to make a contribution towards economic growth, job creation, poverty alleviation and social cohesion by encouraging local and foreign investment, tourism and trade through the promotion of Brand South Africa. Brand South Africa’s work is guided by South Africa’s national objectives of economic growth, job creation, poverty alleviation and social cohesion, as reflected in the Constitution, the Medium Term Strategic Framework, national policy frameworks, Nine-Point Plan, the National Development Plan, the National Communications Framework and the International Relations Strategy. The Internet should be open, neutral, resilient, interoperable and responsive to the growth needs of all. This was the message the Minister of Telecommunications and Postal Services, Siyabonga Cwele, brought to the fifth annual meeting of the African Internet Governance Forum (AfIGIF) recently. The main theme of the meeting, held in Durban from 16 to 18 October, was "Inclusive Development and the Digital Transformation of Africa". "The African continent believes Internet governance should be multilateral and democratic. It should involve all governments and relevant stakeholders – such as academics, NGOs and ICT companies – in their respective roles." The minister cited the launch of the first African Regional Internet Exchange in Johannesburg three weeks ago by African Union (AU) Commissioner, Elham M Ebrahim, as an example of Internet innovation on the continent. The AfIGIF annual meeting has been held every year since 2012. This year's gathering aimed to discuss and finalise African positions on the Internet and its governance ahead of the December 2016 Global Internet Governance Forum in Mexico. 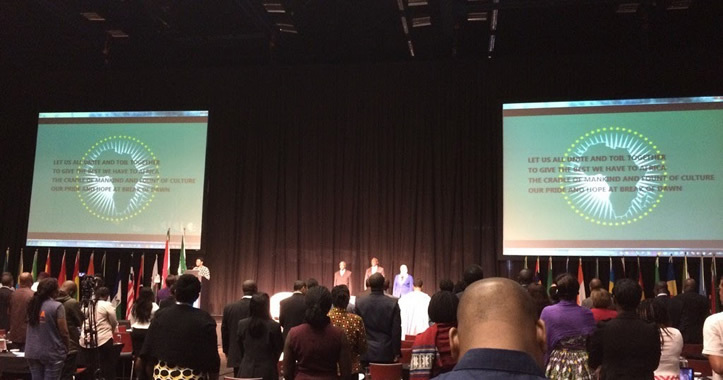 "We are extremely grateful for your continuing partnership," Minister Cwele told delegates. This, he said, would "ensure that we build an inclusive continent by rolling out large infrastructure projects that connect Africans to opportunities – and each other". A robust Internet was essential to achieving the AU’s Agenda 2063, Minister Cwele said. This 50-year plan aims to build effective institutions, enhance accountability, strengthen solidarity and integration, ensure gender equality and youth empowerment, and achieve peace and security across the continent. "AU infrastructure projects, particularly those of power and Internet connectivity, are crucial for this continent to leapfrog in development to be on a par with the developed world," he said. Locally, South Africa Connect, the country's national broadband policy, has been prioritised as part of the Nine-Point Plan to reignite growth after the global economic downturn. The theme for the event is "Addressing the Challenge of Patient-centred Care and Safety”. 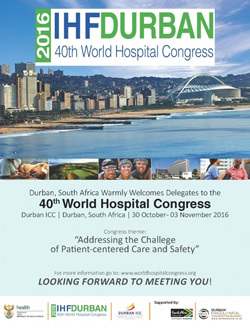 The Department of Health will host the 40th International Hospital Federation World Hospital Congress, to be held in Durban, from 30 October to 3 November 2016. The congress provides a unique global forum where multidisciplinary exchange of knowledge, expertise and experiences in health sector management and service delivery is facilitated. It is a one-stop shop for the healthcare professional seeking the opportunity/environment in which to engage in a 360-degree learning and knowledge-sharing experience among peers. Leaders of key national and international hospital and healthcare organisations and drivers of healthcare policy, management, financial trends and solutions will gather to engage in constructive dialogue on best practices in leadership in hospital and healthcare management and delivery of services. The agreement is aimed at promoting cooperation between South Africa and Italy on Investment in Skills, Research and Water Management and Governance. On 18 October, the Minister of Water and Sanitation, Nomvula Mokonyane, signed an agreement on behalf of the Republic of South Africa with the Italian Republic. There is also intention to pursue joint pilot projects between the two governments and cooperation on the development of basic infrastructure to meet the basic service delivery challenges of water and sanitation provision. The Italian Deputy Minister of Environment, Land and Sea, Barbara Degani, represented the Italian Republic at the signing ceremony. The Western Cape’s agricultural advisory programme has been presented at a United Nations conference this week. 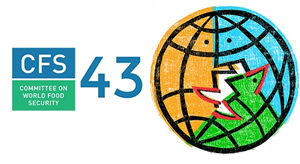 Alan Winde, MEC of Economic Opportunities, recently said senior officials from the Western Cape Department of Agriculture were attending the United Nations Food and Agriculture Organisation's (FAO) 43rd meeting of the Committee on World Food Security. The conference took place in Rome from 17 to 21 October 2016. MEC Winde said the FAO contracted the University of the Free State to document the Western Cape Department of Agriculture’s extension model, which is aligned to the National Government’s policy as well as the norms and standards for extension. This presentation was screened at the conference, with senior managers from the national and provincial departments of agriculture speaking to the programme. MEC Winde said the request to present at the global conference showed the strength of the province’s extension programme. The Minister of Trade and Industry, Rob Davies, has welcomed 3M’s R120-million investment that will expand the company’s operations in South Africa. “Such investment is important and demonstrates the confidence that 3M has in the long-term future of South Africa as a regional manufacturing hub,” said Minister Davies of the science and technology company’s investment. Minister Davies said the investment was a major boost for the manufacturing sector, as the enhancement was designed to improve productivity and would position the Maple Park plant in Pamona, Kempton Park, as one of the globally competitive locations within 3M. The investment will create jobs for an additional 75 skilled individuals, with more opportunities arising across the company due to the extension of 3M’s domestic operations. Managing Director of 3M South Africa, Ismail Mapara, said the company believed that the investment in manufacturing and the creation of new jobs further cemented its history in South Africa and commitment to the same growth and skills upliftment initiatives that the Department of Trade and Industry promoted. “Our US$500 000 automotive line investment offers 3M customers the high-quality products and service they expect, but with even more agility now that we are able to manufacture our film products for the industry with only a ‘to-scale’ drawing of the vehicle,” said Mapara. Cabinet has welcomed hotel group Marriott International’s R3-billion investment in South Africa. Addressing media following Cabinet’s fortnightly meeting, Minister in The Presidency for Planning, Monitoring and Evaluation, Jeff Radebe, said the investment would see the group complete five new hotels. The group announced earlier this month that it would build three new hotels in Cape Town and two in Johannesburg. “The announcement demonstrates the investor confidence in the country and positive future prospects of the local economy,” said Minister Radebe. Meanwhile, Cabinet noted the recent naming of South Africa as the best country for debt management and sovereign bond issuance in sub-Saharan Africa by Emerging Markets Newspaper, an affiliate of the IMF/World Bank Annual Meetings. “The award comes after the World Bank acknowledged the country’s excellence in debt dynamics/composition. These accolades are testament to the success the country continues to enjoy in global capital markets and the prudent manner in which the economy is managed,” said Minister Radebe. The theme of the engagement was: "Deepening Africa's Narrative and Capacities to Deliver Agenda 2063", the Government Communication and Information System (GCIS) said in a statement. African Union (AU) Commission chairperson, Nkosazana Dlamini-Zuma, hosted a joint sitting of the Africa Editors' Forum and Press Officers in Pretoria from 24 to 25 October. "This is the first time South Africa will host the joint sitting of up to 80 editors from across the African continent as well as press officers under the AU banner. The previous meeting was held in Rwanda alongside the AU Heads of State Summit earlier this year," the GCIS statement said. Dlamini-Zuma addressed the forum for the last time as chairperson of the AU Commission and gave African editors an opportunity to engage with her as she concluded her extended four-year tenure. Elections to replace her, which failed to conclude in Rwanda in July, will now be held in January. The GCIS said discussions with the editors would reflect on AU milestones over the past four years; create better understanding of Agenda 2063; discuss the role of African media in popularising Agenda 2063; assess the role of accurate reporting in shaping an African narrative, and advocate media ownership among Africans. No bigger than a medicine capsule, the device is being called “groundbreaking”. The world’s smallest pacemaker, measuring 6,7 mm in diameter, has been implanted into the heart of a 74-year-old woman from Brackenfell in Cape Town. This groundbreaking commercial implant, the first of its kind in Africa post FDA approval, was done by Dr Razeen Gopal, a cardiac electrophysiologist at the Cape Town Atrial Fibrillation Centre, located in Mediclinic Panorama. 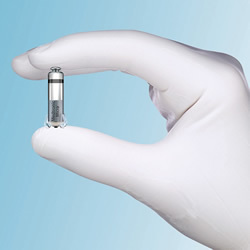 The minute pacemaker is entirely leadless, and at 6,7 mm in diameter and 25,9 mm in length is only one-tenth the size of an ordinary pacemaker. It is implanted directly in the right ventricle of the heart. “It looks like a small medicine capsule and will definitely change the industry and become the standard practice,” Gopal told Health24. Unlike a traditional pacemaker, the Transcatheter Pacing System is implanted directly into the heart muscle. “It does not require leads or a surgical ‘pocket’ under the skin, minimising potential infection,” says Gopal. The pacemaker is hooked onto the heart muscle with special hooks, called tines. It is inserted into the right ventricle, where it is carefully positioned and placed at the bottom of the ventricle. More than 50 researchers from 30 countries are to carry out the first scientific circumnavigation of Antarctica in an attempt to measure pollution and climate change. The international team will sail on Russian research vessel, Akademik Treshnikov, leaving Cape Town on 20 December and returning on 18 March next year. Organisers of the Antarctic Circumpolar Expedition (ACE) hope to foster collaboration in a bid to gain a deeper understanding of humankind's effect on the Southern Ocean. "Researchers will work on a number of interrelated fields, from biology to climatology to oceanography, for the future of this continent," said an expedition press release. "A better understanding of Antarctica is critical, not just for its preservation, but for the whole planet," it added. "Scientific progress depends more than ever on communication between diverse scientific domains. For example, marine biology depends on complex mathematical models currently being developed by oceanographers." The team leaders issued a call last year for research proposals, receiving over 100 ideas. A panel of experts whittled these down to 22. 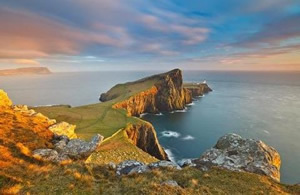 Adopted projects include mapping whales, penguins and albatrosses in the Southern Ocean; measuring the effect of plastic pollution on the food chain; and logging the extent of phytoplankton – the base of the food chain – and its role in regulating climate. ACE is the first project of the newly-created Swiss Polar Institute – a joint venture of various Swiss research and educational institutions that aims to "enhance international relations and collaboration between countries, as well as to spark the interest of a new generation of young scientists in polar research". 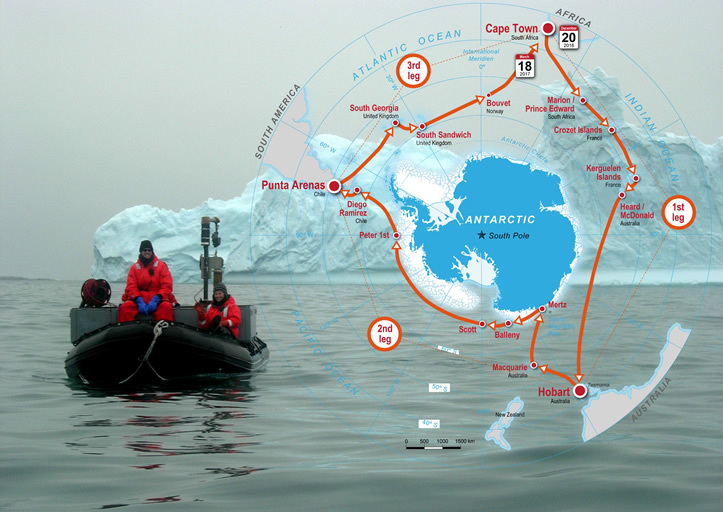 Other stop-offs include the Crozet Islands, South Sandwich, South Georgia and the Mertz iceshelf on Antarctica itself. Cape Point was awarded the National Lilizela Tourism Award for "Visitor Experience: Scenic Beauty" at the annual ceremony held at the Sandton Convention Centre in Johannesburg on Sunday, 16 October 2016. 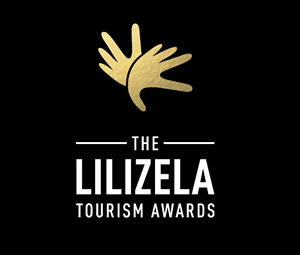 It is the second time that Cape Point has won the Scenic Beauty Award, which falls under the "Service Excellence – Visitor Experience of the Year" Category at the Lilizela Tourism Awards – a Department of Tourism initiative celebrating businesses which grow tourism’s contribution to job creation and gross domestic product. "We are extremely proud that Cape Point has once again been recognised with this prestigious award and salute the teams who work extremely hard to keep service levels in line with world-class expectations," said Judiet Barnes, marketing manager of the Cape Point Partnership. "As the concessionaire managing the facilities alongside SANParks, we are blessed to be able to showcase the site’s breathtaking natural beauty. From the panoramic views to the beaches, the fauna, the flora and the historical landmarks, it is no wonder that Cape Point remains a bucket-list attraction for visitors from near and far." The award comes ahead of Cape Point’s 20th birthday in December. "Now we have another reason to celebrate the iconic site and everything we are able to offer our visitors," said Barnes. It was all glitz and glam as Africa's top music stars were honoured at the 2015 MTV Africa Music Awards in Johannesburg on Saturday night, 22 October. The awards ceremony was held at the Ticketpro Dome. Bonang Matheba shared hosting duties with Nomzamo Mbatha and Nigerian singer Yemi Alade. Among the performers were American rapper Future and local and African stars Yemi Alade, Babes Wodumo, Nasty C, Cassper Nyovest, Wizkid and Maphorisa. Best International: Drake (United States of America). The award-winning “Shepherd and Butchers” won the coveted Maverick Award for Best Feature Narrative and the Hasklell Wexler Award for Best Cinematography at the Woodstock Film Festival recently. 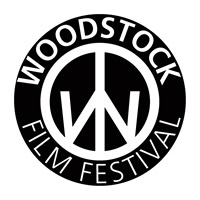 Acknowledged as one of the leading independent film festivals in the United States, it was founded 16 years ago in the New York State town of Woodstock, which has established itself as a creative arts centre since the legendary Woodstock Festival in 1969. 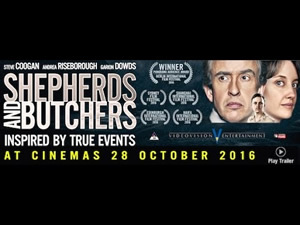 Shepherds and Butchers was the most talked about film at the festival, where in post-screening discussions, festival goers expressed how much they liked the film and commended the merits of the film. It also evoked conversation and debate around the issue of capital punishment. The film centres on a lawyer who takes on a case of a prison guard in South Africa who is traumatised by the executions he's witnessed. Helmed by award-winning director, Oliver Schmitz, the film is produced by Anant Singh and Brian Cox who also wrote the screenplay. It stars talented rising star Garion Dowds alongside Academy Award nominee, Steve Coogan (Philomena), and Andrea Riseborough (Birdman, Oblivion) with a host of well-known local actors such as Deon Lotz, Robert Hobbs, Eduan van Jaarsveldt, Marcel van Heerden and Sylvia Mdunyelwa. The film will be released in South African cinemas on Friday, 28 October. Mamelodi Sundowns won a fairytale first CAF Champions League title on Sunday, 23 October, despite a 1-0 second-leg loss to Zamalek of Egypt in Alexandria. A Stanley Ohawuchi goal after 64 minutes was not enough for the home team as they trailed by three goals from the first leg in Pretoria last weekend and lost 3-1 on aggregate. It was a remarkable triumph because the South Africans were eliminated in the final qualifying round in April only to be reinstated when their Democratic Republic of Congo opponents were disqualified. 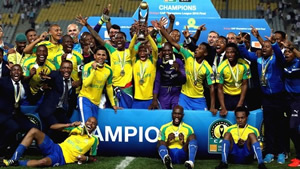 Success for Sundowns made them $1,5 million richer and secured a place at the FIFA Club World Cup in Japan during December. "It was an amazing journey of ups and downs and now we are the champions of Africa," said Sundowns' Zimbabwe striker Khama Billiat. "We look forward to Japan and facing the best clubs in the game. It is going to be an absolute pleasure." Winger Keagan Dolly said: "We knew it was going to be difficult because Zamalek are a great team with some outstanding individuals. "Some people will say we were lucky to get a second chance after being eliminated, but I believe we deserve to be African champions." An estimated 60 000 predominantly Zamalek supporters were inside the 86 000-capacity Borg El Arab Stadium on the outskirts of Alexandria as the match kicked off. 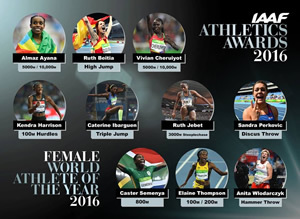 Wayde van Niekerk and Caster Semenya have been nominated for the 2016 World Athlete of the Year following their heroics at the Rio Olympics. Van Niekerk smashed Michael Johnson's world record in the 400 m while Semenya dominated the field in the 800 m as Team South Africa celebrated their only two gold medals at the Games. According to the IAAF website, Van Niekerk has been nominated alongside treble Rio winner, Jamaica's Usain Bolt, as well as English middle/long-distance sensation, Mo Farah. Last week marked the opening of the voting process ahead of the IAAF Awards Night in Monaco on Friday, 2 December. The IAAF Council and the IAAF Family will cast their votes by email, while fans can vote online via the IAAF's social media platforms. The IAAF Council’s vote will count for 50% of the result, while the IAAF Family’s votes and the public votes will each count for 25% of the final result. The IAAF Family includes IAAF member federations, IAAF Committee members, IAAF meeting directors, IAAF athlete ambassadors, athletes’ representatives, top athletes, members of the international press, IAAF staff members and the IAAF’s official partners. At the conclusion of the voting process, three men and three women finalists will be announced by the IAAF. 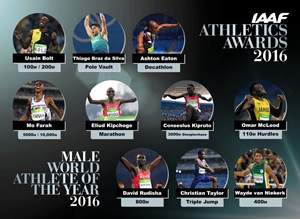 The male and female World Athletes of the Year will be announced at the IAAF Awards Night. Top South African referees, Craig Joubert, Marius van der Westhuizen and Jaco Peyper, have each been tasked with taking charge of two Test matches in the November internationals. World Rugby said Joubert would officiate the clash between Wales and Australia at the Principality Stadium in Cardiff on 5 November and the Test between Fiji and Japan on 27 November at Stade de la Rabine in France respectively, while Van der Westhuizen would take charge of the tests between Ireland and Canada at the Aviva Stadium in Dublin on 12 November and the match between Wales and Japan in Cardiff on 19 November. Peyper, meanwhile, will hold the whistle in the tests between Ireland and New Zealand in Dublin on 19 November, and England and Australia at Twickenham on 3 December.